Are you having thoughts of suicide, or worried about a loved one who is? There are resources to help! 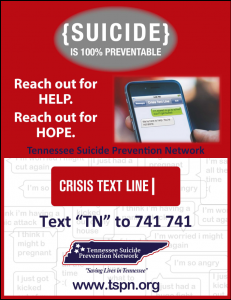 24/7 Crisis Text Line for Tennessee Residents – Text TN to 741-741. Mobile Crisis Services is a 24/7/365 response team for those who are experiencing a mental health emergency. You may access both adult, youth and children services by calling the statewide crisis line or your local mobile crisis center. Call 855-CRISIS-1 (855-274-7471) and you will be routed to a trained crisis specialist in your area.